The wait is over, WordAds 2.0 was introduced today. If you never heard about WordAds, it’s the advertising program that allows bloggers at WordPress.com to earn a little extra income with their blogs by enabling advertising banners. Previously it was a little bit harder to get into the program as only blogs with a certain amount of impressions got accepted, but now with WordAds 2.0 any family friendly blog with minimal page views will be considered for immediate admission to WordAds, so you might want to check it out! For those of you who know the WordAds program since a while, I checked the WordAds 2.0 backend and so far there are no new options for us users, but they made some changes in the background. They do now have a real-time bidding environment where ad agencies and buyers bidding in real-time on blogs and ad impressions. They say that more competition means that it will make the most of the earnings potential, however, only time will show what it means for individuals in the program and their monthly earnings. The WordAds rates and earnings decreased over the last months, it was said that the problem occurred industry wide. If the rates will go back to normal or if they even will get better with WordAds 2.0, that remains to be seen over the next months. If the rates go back to normal, you might get a nice little reward with you blog depending on your page views. Finally they also mentioned WordAds 2.1, which means they want to come up with more improvements. Are you curious about WordAds? Will you enable ads on your blog? I am rather interested in this although I don’t know if I get enough traffic to make much on it. I read your previous articles about it and agree with you. If WordPress are going to run ads anyway why should we writers and photographers not get a bit if only to pay for upgrades, online storage etc? I will go and have a look at the website later. Yep, that’s how I see it… I saw both, I did blog with and without earnings, but in each case there were ads on my blog for users outside of WordPress (not logged in), so that I decided to take a share of it when they offered us the posibility back then. Since then I thought WordAds is a fair program. I met the traffic criteria back then when I applied, but I am happy that they did lift the criteria now, so that anyone can try it out. I would blog with and without earnings, it wouldn’t matter, but still I think WordAds can motivate people to blog, and to experiment with content. To earn a little pocket money you will need a couple of thousand visitors per month. My other article you saw will give you a rough impression what to expect, although the rates can change at any time and did change in the past, so that it’s only a rough calculation. My doll blog probably gets enough traffic to give it a shot. I’ve been getting around 800 visitors a month consistently even though I’ve hardly been writing for it the last few months. Did you say it was based on visitors or views? It looks as if I would need my own domain name but I would not have a problem buying one as after two and a half years I think I am committed to blogging so I may try it and see if it works for me. Any extra income that helps pay for hobbies will be useful now and I’d like to buy more photo storage space online so definitely worth thinking about.Doll bloggers I read often do paid reviews of products so I think most would not have a problem with ads on my blog. If they do there is always ad blocker. They count and pay every view and call it an “impression”… so if one of your visitors will load and read 5 blog articles, that will count for 5 impressions. I have no idea how much impressions (views) per month your 800 visitors cause but even if every visitor will load two or three pages, I do not think that this will be very viable. You also need to factor in that only US and European visitors have the highest paying out rates per impression. I believe you could make around $1 or $3 per month with 800 visitors. Then comes the next problem, they pay you via PayPal once you earned $100, that could mean it would take 33 or maybe even over 100 months until you would receive a payout, unless your traffic did increase at some point. I don’t want to advise against using WordAds, but to compensate the yearly costs for a domain or space upgrade, you will most likely need much more than 800 visitors per month. If you are sure there will be much more blog views over time, it would be still worth to test it, I mean if this could motivate you to create more content or to work on the blog, but if the 800 visitors will not greatly increase over time, it’ll be hard to get the domain costs back in. Out of experience I can tell you, to get paid $100 per month, your blog will need around 100.000 page impressions per month. With 25.000 page impressions per month you would for example get $100 every 4 months due to the $100 payout hurdle, but that would be still fine…. but you maybe get my point, in case your blog earns $5 per month, it’ll take quite some time (20 month) until you reach the $100 payout hurdle they set. If you planed to get a domain anyway, I’d say test WordAds to see how things go… but don’t get a domain with the idea that WordAds will compensate the costs, that would take much more traffic than 800 visitors. As said, something like 10.000 or 20.000 monthly views would be a small start, you can still reach higher numbers like 50.000 later on… but I’d say 800 (maybe 1000-2000 views per month?) is too low to test WordAds I guess. The earnings for the month of October are out 🙂 … so much for the hype about WordAds 2.0 changing the way WordAds works, I didn’t notice any improvement in my Earnings per 1000 page views or even my earnings per 1000 Ad impressions. Maybe, we have to wait further till new Advertisers start trusting WordAds and adopt it in their campaigns. But… over all, I have to say, I am disappointed and I was expecting more out of it. or maybe this will only take effect on November’s earnings? Yes the December WordAds stats might be interesting, since WordAds 2.0 was released November 2. So, if there are improvements at all, they can only take effect in November. I think we only can find out next month if WordAds 2.0 will come with improvements, since WordAds 2.0 was released on November 2,… it’ll be interesting to see the WordAds stats posted in December I think. Also it’ll be interesting if you are right, I wonder too if adertisers will trust the new “real-time bidding environment” and WordAds right away. Agree 100%, I guess most of the work and development effort was spent building the backbone of the new WordAds 2.0 (i.e. real time Ad management / bidding) and not much to show to the end user. Option 2: loose our mobile visitors (especially that google can detect mobile friendly sites) + have bad user experience for mobile users just to display 3 Ads per page. WordAds team has a lot of work to do before they can make both bloggers and advertisers happy. So far Twenty Fourteen is the only theme I have found which does a good job in terms of supporting both WordAds and Mobile Friendliness. 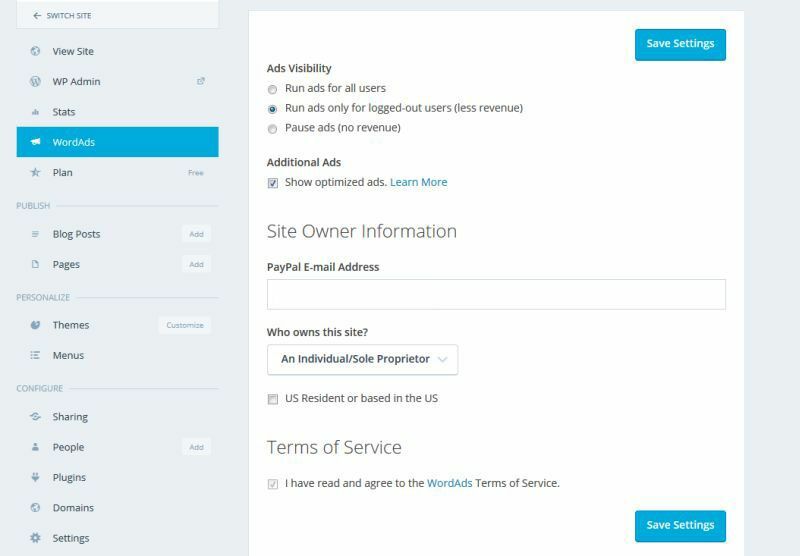 This is an incredible big issue for me too, in 2015 I went hundreds of times through this list: https://theme.wordpress.com/themes/features/wordads/ and couldn’t make a decision to switch my theme. It happens rarely that they add new WordAds supported themes to that list. You mentioned exactly with what I do battle since some time. I would like to change my theme too since the Twenty Ten theme has a couple of problems or features that I miss, generally it is a theme with an outdated design. But the biggest problem is that if you go through a tag like this one: https://diaryofdennis.com/tag/photos/ you will notice that the images are not shown in the excerpts of the tag page, but only text excerpts and that is a problem for a blog focused on photography as well. Next problem is that I have to enable WP mobile design in the dashboard with the Twenty Ten theme, since the Twenty Ten theme is not responsive and bad for mobile, but with the mobile design I lose already money since it shows only one ad below the posts, however, this does at least introduce good mobile experience to my site. But you mention two points why it’s not that easy to make a theme switch, because the WordAds supported themes come with other problems and most of them are outdated as well. So, for me 2015 was a lot of “thinking” but not “doing”… I am stuck in the decision to change my theme, and the major reason is WordAds. Because if all themes would be supported, I would have no trouble to find a good theme that fits to my needs, there are tons of themes, and I have a list of themes that I really like, but most of them don’t work with WordAds. In early 2015 I wrote them a mail exactly about this issue, and they replied that they would focus on WordAds 2.0 first. Now it seems they will focus on WordAds 2.1. I can just agree, they shouldn’t forget to make themes compatible, because it’s an issue. I pretty much understand your problem, because I battle with this since some time too. Yeah, it’s not really improved yet, still quite low rates in my opinion… maybe they will get more advertisers signed up over the next months, maybe then the rates will improve, but for now it still looks bad. It’s hard to answer the question since I don’t know where the majority of you visitors come from and a lot of other factors come into play. If they are American and European visitors, and if you have enabled 3 ads on your site, you probably need around 90.000 visitors under the current rate. A half year ago I would have said 50.000 visitors but WordAds pays less and less each month, they promised the rates would go back up, but so far I don’t see any increasement. I usually don’t submit my articles anywhere (except auto-publishing to the known social media sites), because my readers usually do this on their own, that means I can not give you a lot of tips. My philosophy is that I don’t want to work too much to get traffic, I want to sleep when I get traffic. The only exception I make is Reddit, but I am Reddit user since a long time. I’d suggest to submit your stuff to related communities at Reddit, but it’s not that easy as it sounds. The reason is, you have to contribute to the communities with mixed content, not only your content, but also submiting content from other sites and that most of the time, but in the mix you can at times post your own stuff too. It’s still worth it, I had upvoted posts on the front page that got 20k views in an hour, just to tell you what kind of ballpark Reddit is. The problem with Reddit is, that the community consists of tech-geeks, and they can smell if you only registered to share your own stuff, and they flag you, and that can result in a shadow-ban of your domain. That’s why I said it’s not easy to use Reddit as a content marketeer, but as a community member it is easy to use because you know how the sub-forum rules, and the community, and the main Reddit rules. Other than Reddit, I can not give you any tips sorry. I want to earn but I don’t know how it all works. But you need a com domain for your blog for your wordpress.com blog to participate in the ad program of WordAds.